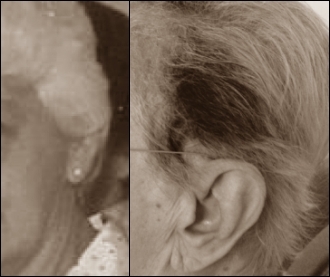 Yesterday we wrote that, in a dose of several hundred milligrams, para-aminobenzoic acid [PABA] restores grey hair to its original colour according to slightly dubious studies done in the mid-twentieth century. Another supplement that can help greying hair is Mucuna pruriens, two Brazilian neurologists discovered. The neurologists encountered this side effect when they started to treat an 85-year-old woman who had Parkinson's with Mucuna pruriens. 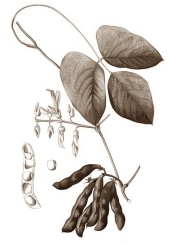 Mucuna pruriens is a plant that contains the amino acid L-dopa, which is converted into dopamine in the brain. The brain's natural synthesis of dopamine decreases in people who have Parkinson's. Doctors try to compensate for this by prescribing L-dopa and substances that inhibit the breakdown of L-dopa, such as carbidopa. The woman was already taking a twice-daily dose of 250 mg synthetic L-dopa and 25 mg carbidopa. When the doctors added 1000 mg L-dopa daily in the form of Mucuna pruriens, the woman's hair round her temples regained its original colour. The photo on the left shows the woman at 65 years of age. At that point she had already gone totally grey. The photo on the right shows the woman at 85, after she’d started taking Mucuna pruriens. Neurologists sometimes prescribe Mucuna pruriens for people with Parkinson’s because the L-dopa that it contains works better than the synthetic form of the amino acid, and it has fewer side effects. The Brazilians also have an explanation for this effect of Mucuna pruriens. It's not unusual for grey-haired Parkinson's patients to regain their original hair colour when on L-dopa medication. L-Dopa is a precursor of melamine, the pigment that gives hair colour. Apparently L-dopa supplementation can induce the hair producing cells to start manufacturing pigment again. There are reports of psychosis associated with the consumption of extreme amounts of Mucuna pruriens beans, in which 203 cases of acute psychosis were recorded over a 6 week period during a period of famine in Africa.